Valuing all lives equally would transform how we respond to the climate crisis. On the penultimate day of the recent United Nations climate summit in Lima, Peru, activists staged a “die-in” outside the conference center. They were honoring the thousands upon thousands of lives already lost in disasters and conflicts deepened by climate change. And they were doing something else: symbolically joining the increasingly global #BlackLivesMatter uprising, which has brought shopping malls and busy intersections to a standstill from the United States to the United Kingdom. The courageous demonstrators shouting “I can’t breathe!” and “Hands up, don’t shoot!” are asserting a core principle about the value of every human being, starting with the most discounted. Standing in solidarity with their calls for a transformation of the criminal-justice system is of paramount importance. But why should the questions raised by #BlackLivesMatter end there? What does #BlackLivesMatter, for example, have to do with climate change? Well, everything. If wealthy white Americans had been left without food and water for days in a giant stadium after Hurricane Katrina, would it be possible for so many Republican politicians to deny the crisis? If Australia were at risk of disappearing and not large parts of Bangladesh, would Prime Minister Tony Abbott feel free to extol the burning of coal as “good for humanity”? If Toronto were being battered by historic typhoons that caused mass evacuations and not Tacloban in the Philippines, would building tar-sands pipelines still be the centerpiece of Canada’s foreign policy? The reality of an economic order built on white supremacy is the whispered subtext of our entire response to the climate crisis, and it badly needs to be dragged into the light. I vividly remember the moment when the centrality of that racism burst onto the world stage. It was exactly five years ago, at the now-infamous UN climate summit in Copenhagen. On the second day of the gathering, a document was leaked showing that governments were on the verge of setting a target that would cap the global temperature rise at 2 degrees Celsius (3.6 degrees Fahrenheit). The temperature target—pushed by wealthy nations in Europe and North America—would likely not be enough to save some small, low-lying island states. In Africa, the target would translate into a full-scale humanitarian disaster. When word of the text got out, African delegates immediately filled the conference center’s sterile hallways with harrowing shouts of “We will not die quietly!” The paltry sums that rich countries had pledged for climate financing, meanwhile, were angrily denounced as “not enough to buy us coffins.” Black lives matter, these delegates were saying—even if this corrupted forum was behaving as if that was far from the case. The highly racialized discounting of certain lives also plays out within countries. I was reminded of this while reading about Akai Gurley, the 28-year-old unarmed black man who was “accidentally” shot and killed in November in the dark stairwell of a Brooklyn housing project. Like the dilapidated elevator, the building’s lighting system had been left unrepaired despite complaints. And when the neglect of a public institution that disproportionately serves African-Americans intersected with a policeman’s armed fear of black men, the result was deadly. When Superstorm Sandy hit New York City two years earlier, a similar combination of forces showed its brutal face, though on a much larger scale. The water and electrical systems of derelict public-housing projects were knocked out for weeks. But the worst part was how fear of those darkened buildings clearly played a role in keeping government officials and relief agencies from checking in on sick and elderly residents, leaving them stranded in high-rises without basic provisions for far too long. “George Bush doesn’t care about black people,” Kanye West famously said during a 2005 telethon for the victims of Hurricane Katrina. As that storm showed so nakedly, the worst impacts of extreme weather follow racial lines with devastating precision. Race helped determine who was abandoned on their rooftops; who was called a “looter”; who was shot on the streets; and whose homes were demolished, never to be replaced. The direct impacts of fossil-fuel burning follow strikingly similar racial fault lines. According to one study, a staggering 21.8 percent of children living in New York City public housing have asthma, three times higher than the rate in private housing. The choking of those children is not as immediately lethal as the kind of choking that stole Eric Garner’s life. But it is very real nonetheless. If we refuse to speak frankly about the intersection of race and climate change, we can be sure that racism will continue to inform how our governments respond to this crisis. 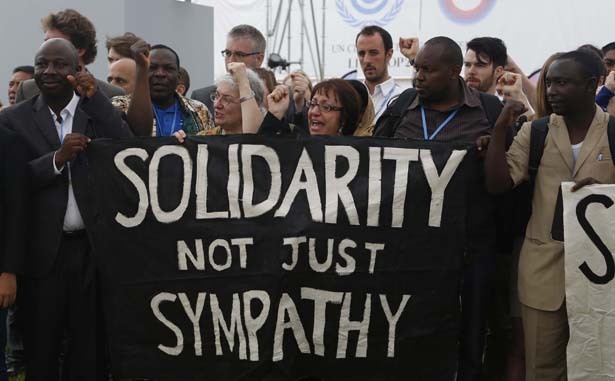 Racism will express itself in the continued refusal to provide serious climate financing to poor countries so they can protect themselves from extreme weather. And it will manifest itself in ruthless crackdowns on migrants, many of whom will be fleeing homes made unlivable by severe climate change. What climate change tells us is that this is also true on a global, species-wide scale, because we are now headed toward levels of warming that are incompatible with anything resembling organized society. This is no coincidence: it turns out that once we allow decision-makers to rationalize the sacrificing of some lives, it’s awfully hard for them to stop. If we insist, on the other hand, that black lives matter, then global warming is already a five-alarm fire, and it’s high time we acted like it.